For those, who want to be on TV, TV presenter jobs are certainly a good choice. Television industry offers innumerable opportunities to aspiring actors to be on TV. Some of the venues for television hosting or TV presenting jobs are news oriented programmes, game shows, dance shows, singing shows, comedy shows, travel shows, history shows, science shows, cooking shows, and much more. Based one one’s area of interest, one can look for the presenting jobs to enjoy a life of unparalleled fame and fortune. The job of a TV presenter is basically to host the show. Although the TV presenter is given a script containing the content that needs to be delivered to the audiences, he needs to possess a sound knowledge on the subject of the show. For instance, if you want to be on TV on a travel show, you must have the innate interest in travelling. Your passion and love for travelling would let you host the show in a more natural way and would help you make a better connection with the audience of your show. If you take up the TV presenting job just to be on TV and to earn money, you would appear as an actor playing a defined character. People would find you boring and would most probably lose interest in your show. Another important quality that you must have to be a TV presenter is outgoing personality. You must have a charismatic personality so as to attract viewers to your show and to make them follow your show regularly. Develop an instant spark in you, the ability to impress people, and to involve them completely in your TV show. Although there is no replacement for natural talent, some degree of professional training and guidance is also required if you want to be on TV. You must understand the way TV shows are made, the way TV presenters and actors are expected to perform, and the acting skills and qualities that are imperative for making the TV show a success. For this, it is advisable to pursue a mass communication course in Television and film and to join a reputable training academy to get hands on acting experience. Good training institutes are run by ex-TV actors and directors who provide essential guidance to actors aspiring to be on TV. 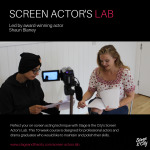 You would learn the A to Z of the acting in the TV industry which would help improve your prospects in the real world.